(Directions 1 – 5): In the following question assuming the given statements to be True, find which of the conclusion among given conclusions is/are definitely true and then give your answers accordingly. Therefore, conclusion I and II forms a complementary pair. Hence, either I or II follows. Given statements: D ≥ E > F = A ≤ U < L ≥ T = R Conclusions: I. F < L → True (as D ≥ E > F = A ≤ U < L ≥ T = R) II. D > A → True (as D ≥ E > F = A ≤ U < L ≥ T = R) Therefore, both conclusions follow. Therefore, only conclusion II follow. Hence, neither I nor II follow. A, B, C, D, E, F, G and H are eight friends from different cities viz. Kolkata, Patna, Bangalore, Lucknow, Chennai, Bhopal, Delhi and Mumbai but not necessarily in the same order. They are sitting around a square table facing the centre, two friends on each side. 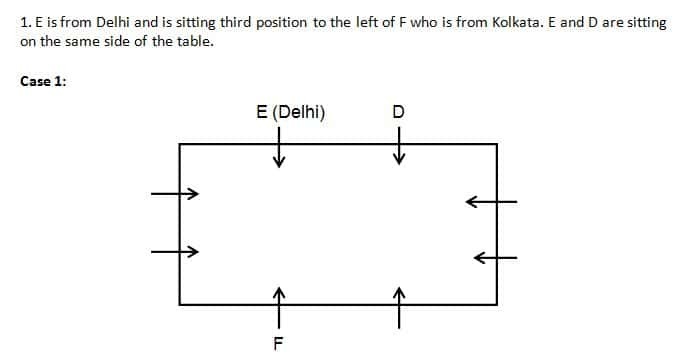 E is from Delhi and is sitting third position to the left of F who is from Kolkata. E and D are sitting on the same side of the table. 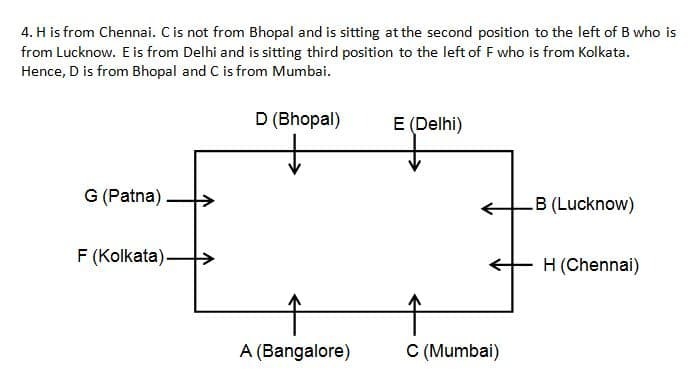 C is not from Bhopal and is sitting at the second position to the left of B who is from Lucknow. H is from Chennai. 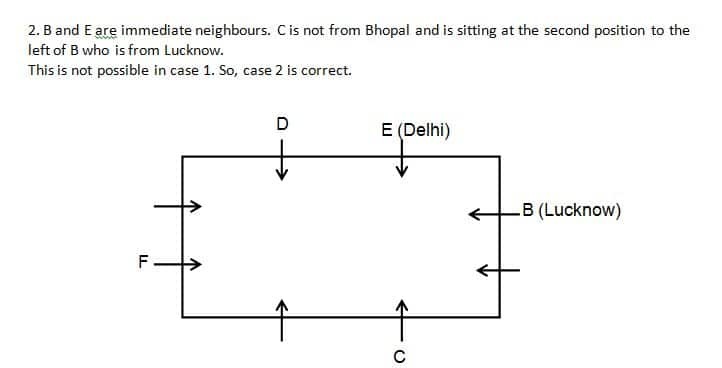 A who is from Bangalore is sitting between F and C. B and E are immediate neighbours. The person who is from Patna is a neighbour of D.
Who among the following is from Bhopal? Who among the following sits third to the right of the one who likes Mumbai? Who among the following pairs sits on the same side? Who among the following pairs are immediate neighbours? How many persons sit between B and the one who likes Kolkata?